US ArmyU.S. Army Reserve Pvt. 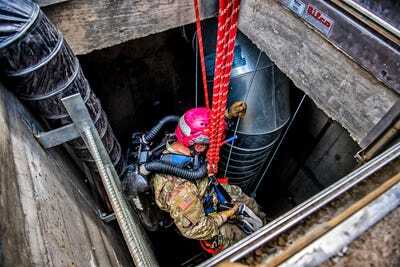 Kenneth Collins, 376th Engineer Firefighter Detachment, pulls himself from a confined space familiarization tube at Combat Support Training Exercise (CSTX) 86-18-02 at Fort McCoy, Wis., August 13, 2018. A space is confined if it has a limited or restricted entry or exit point. 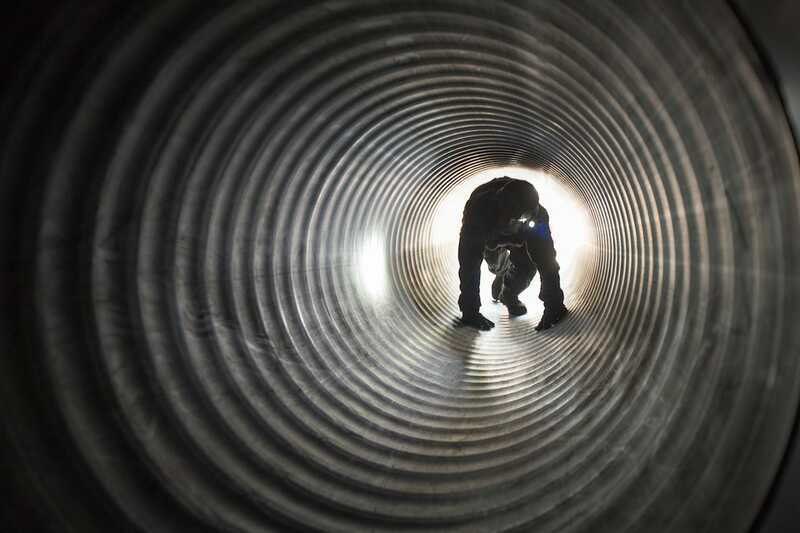 “Confined spaces include, but are not limited to, tanks, vessels, silos, storage bins, hoppers, vaults, pits, manholes, tunnels, equipment housings, ductwork, pipelines, etc.,” according to the Occupational Safety and Health Administration. And the US military trains for all different kinds of scenarios in such spaces. The main reason the military conducts confined space training is for rescues, oftentimes a fellow service member who may become trapped while doing some kind of maintenance. 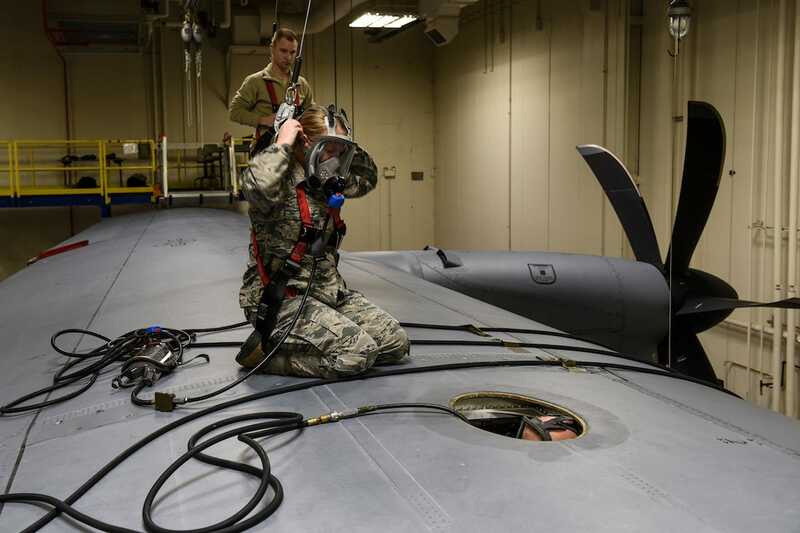 US Air ForceAir Force Joseph Chavez from the 120th Airlift Wing, Montana Air National Guard performs a confined space rescue on Feb. 13, 2017. Such as a fellow airman working on an aircraft. US Air ForceSenior Airman Jada Lutsky, a fuel system specialist with Pennsylvania Air National Guard, dons a respirator during a confined spaces rescue exercise on Feb. 24, 2018. Sometimes they have to be tethered into the confined space. DoDMembers of the 911th Technical Rescue Engineer Company enter a manhole and extract simulated patients during a training exercise on August 1, 2018. 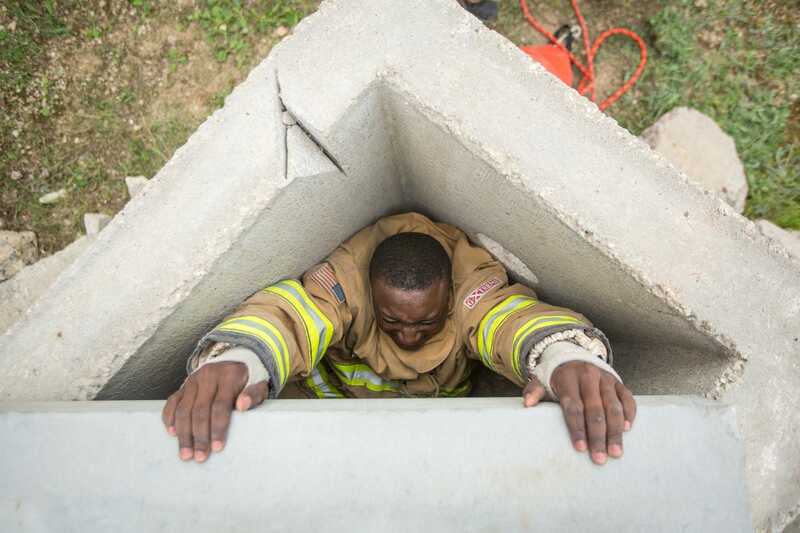 Military firefighter units often train for such confined space scenarios. US ArmyArmy Spc. Ridwan Salaudeen, 758th Firefighter Detachment, climbs through a confined space at Fort McCoy, Wis. on August 9, 2017. Service members even train in building collapse simulators. US ArmyAn Army Reserve soldier navigates his way through a building collapse simulator at Fort McCoy, Wis. on August 13, 2018. US Marine CorpsMarine Cpl. 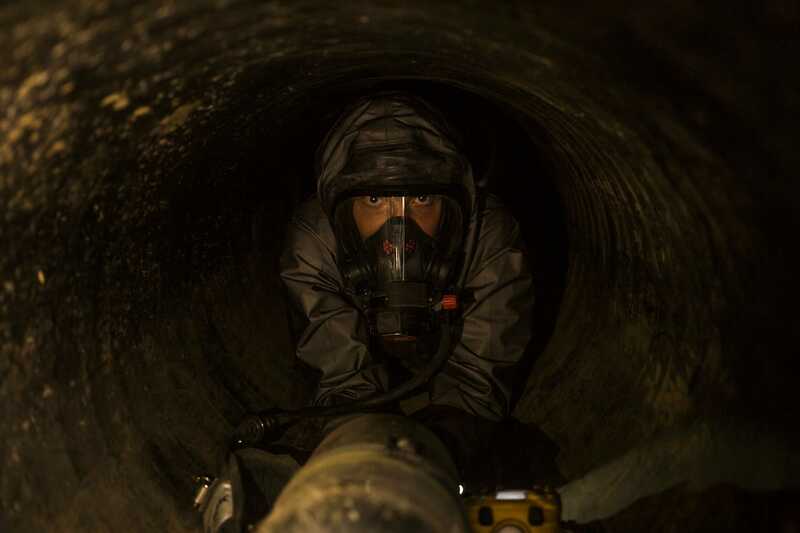 Seth White, a Chemical, Biological, Radiological, and Nuclear (CBRN) defence specialist, crawls through an underground tunnel while wearing a Level-C hazmat suit on Oct. 3, 2018. 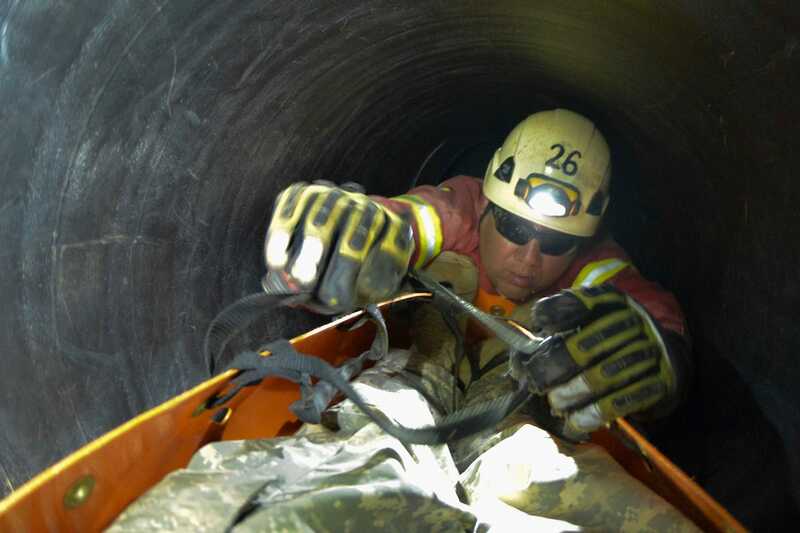 This variety of confined spaces training scenarios give troops experience in how to read site maps and determine what kind of equipment and procedures to use. US ArmyArmy Reserve Spc. 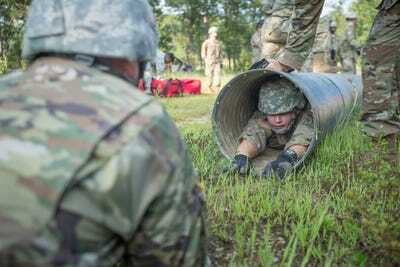 Alex Thompson, 376th Engineer Firefighter Detachment, crawls through a tube for training at Fort McCoy, Wis. on August 13, 2018. But first they have to get used to the confined spaces. 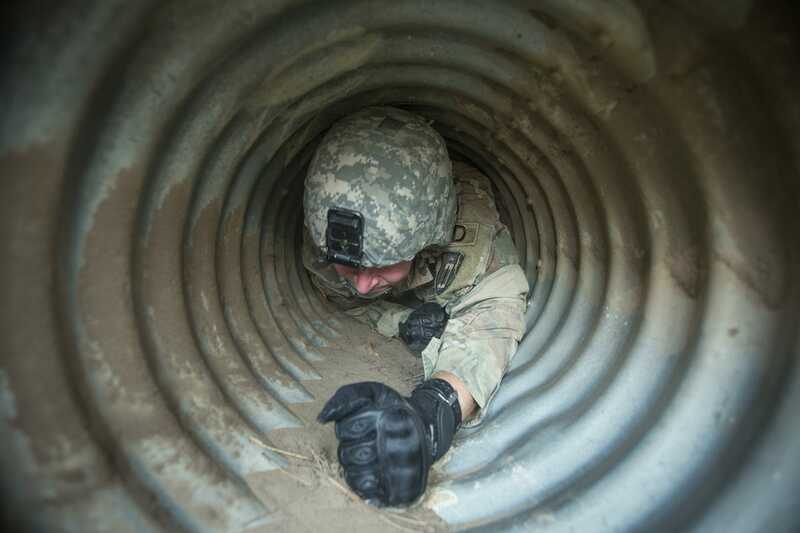 US ArmyArmy Reserve Brett Lehmann, 376th Engineer Firefighter Detachment, crawls through a tube for confined space familiarization training at Fort McCoy, Wis. on August 13, 2018. And the whole thing seems pretty gruelling. US ArmyArmy Reserve Pvt. Kenneth Collins, 376th Engineer Firefighter Detachment, pulls himself from a confined space familiarization tube at Fort McCoy, Wis. on August 13, 2018.